Total duration of this St. Petersburg tour is 24 hours. Times and itinerary may vary depending on your cruise schedule. 8:00am - Your guide will meet you after you clear Passport control at the St Petersburg sea passenger port terminal. 8:30am-12:00pm - Start your tour will St. Petersburg overview sighseeing. You will see the historical part of the city, Nevsky Prospect, Square of Arts, Rosstrel Columns, the Winter Palace and Palace Square, Bronze Horseman, Strelka, stop on St. Isaac's Square, Peter-And-Paul Fortress and other famous landmarks. You will visit Peter-and-Paul Fortress with Cathedral (the city's birth place and the burial place of the Romanov royal family) and Spilled Blood Church. 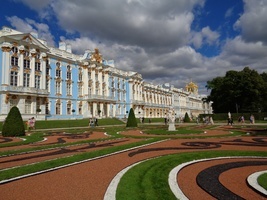 12:00-2:00pm – Our next stop is at the Hermitage Museum. You will explore treasures of one of the richest world art museums housing the Royal collection of European masters (Leonardo da Vinci, Rafael, Michelangelo, Rubens, Titian, Rembrandt etc. ), the French Impressionists and Post-Impressionists collection rivaled only by the French collections. 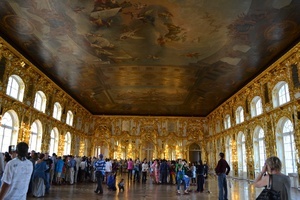 You will also take a special tour of The Winter Palace and view royal living rooms and gala halls. 2:00-2:30pm - A short break for lunch (lunch price is not included). 3:00-4:00pm – Rivers and canals mini-cruise. You will enjoy the beauty of St. Petersburg from a different angle and see why it is ofter refered to as Venice of the North. 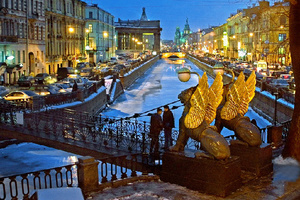 St. Petersburg is almost entirely built on a series of islands across the delta of the Neva River, formed by narrow canals and rivers and connected by over 350 bridges. 4:30pm - back onboard the cruise ship. from 6:00pm - Optional evening program. 8:30am - meet your tour guide at the sea terminal. 9:00-10:00am - transfer to the town of Pushkin. On your way to Pushkin you will see residential and suburban areas of St. Petersburg where local residents live and work. 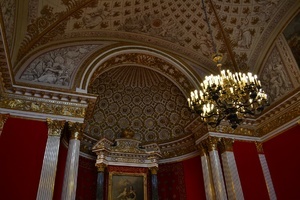 10:00-11:30am - In Pushkin we will tour the grand baroque Catherine Palace with its endless Golden Gallery of halls and rooms: Great Hall of Mirrors, Picture Hall, Gala Dining Hall, Marble Staircase and the stunning Amber Room. etc. The palace is surrounded by the beautifulCatherine Park. 11:40am-12:00pm - A short break for lunch (lunch price is not included). 12:00-12:30pm - transfer to Pavlovsk. 1:00-3:00pm - visit inside the Emperor Paul's Palace to view the most lavish interiors decorated to the tastes of the Emperor Paul and his spouse Maria. We will visit the Italian Hall, The Grecian Hall, The Hall of War and The Hall of Peace, the Libraries of Paul I and Maria Fyodorovna, the Boudoir, the Gala Bedroom, and the Tapestry Room with its rare Gobelin tapestries from the famous Don Quixote series given to Paul I by Lois XVI. The park around the palace is one of the largest parks in Europe. 3:00-4:30pm - transfer to St. Petersburg, take a metro ride (optional if time permits). 9:30am - meet your tour guide at the sea terminal. 9:30-10:30am - Drive to the town of Peterhof, on your way you will see summer houses (called ‘dachas’) of the residents of St. Petersburg. 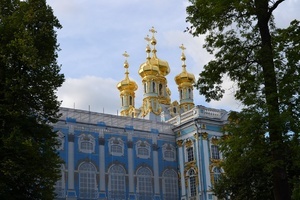 10:30am-1:00pm - Tour Petergof Grand Palace and Park with Fountains. You will walk in the Upper and Lower Petergof Parks, enjoy the spectacular view of the Grand Cascade with its shining gilded statues and Grand Peterhof palace, learn about the unique fountain system that operates without pumps, enjoy the 'trick fountains' invented by Peter the Great to entertain his guests, stroll along the Gulf of Finland to admire magnificent sea views and the St. Petersburg panorama. 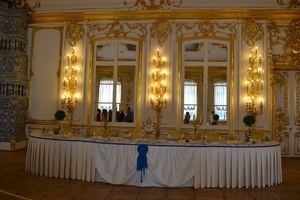 Visit inside Grand Peterhof Palace, see the royal gala and private living rooms, Oak Study of Peter the Great. 1:00-1:40pm - Return to St. Petersburg by hydrofoil (optional) or by car. The speed boat will allow you to avoid traffic jams. 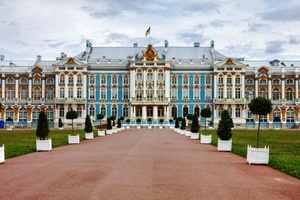 3:00-4:00pm – Visit the Yusupov Palace, once the home of one of the wealthiest families of Russia, famous for its lavish interiors and historic events of the murder of notorious Grigory Rasputin. Thank you for the wonderful time in St Petersburg! Ferry trip from Helsinki was also fun. All in all, a fantastic time thanks to East West Tours!